Moisturizing lip balm soothes dry lips, helps heal chapped lips, and protects them from sunburn. 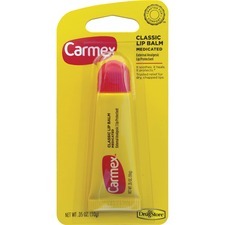 Original flavor formula of Carmex Lip Balm is also designed to alleviate the roughness of dry lips so your lips stay soft. Also use the balm to replace moisture lost from wind, sun and dry air, and to help speed the healing process. Camphor alleviates pain. Menthol kills germs and relieves discomfort. Phenol gently numbs your sore lips and removes old, dead skin.